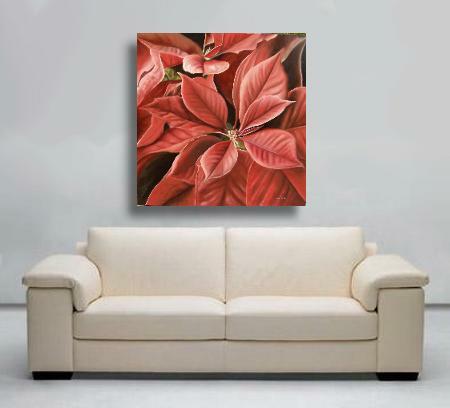 A Poinsettia Painting, here's a great Christmas Themed Painting. 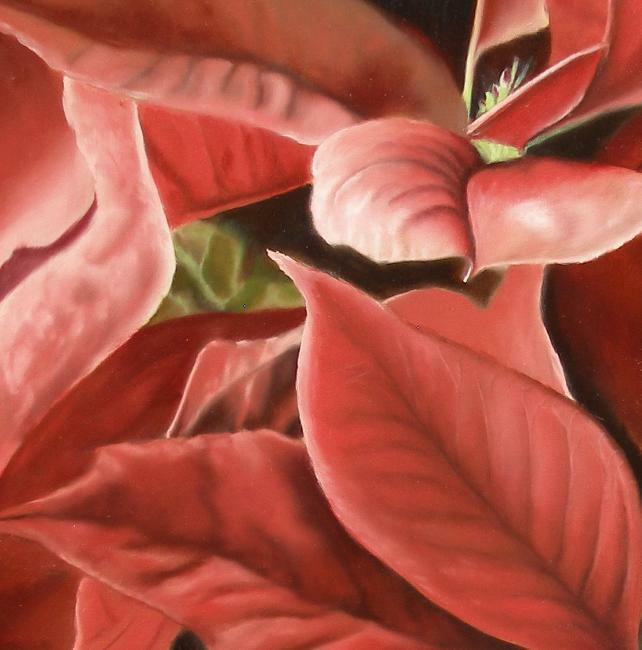 Poinsettia Painting titled "Poinsettia Epatante"
The poinsettia painting you see way at the bottom of the page is one of several Christmas themed paintings I've done over the years. You know Christmas is close by when you begin to see these rich red beauties showing up in garden centers, grocery stores, and church decorations. The botanical name of the poinsettia is Euphorbia Pulcherrrima, meaning "very beautiful", it's known by many other common names in other parts of the world. Wow! So much behind this little red plant. But there's more! Cultivation of the poinsettia goes all the way back to the 14th Century where the Aztecs used it for medicinal purposes, the sap reduces fever and the leaves for their red dye. In 1825, our Ambassador to Mexico (and an amateur botanist) brought one back to South Carolina. Its popularity grew quickly. 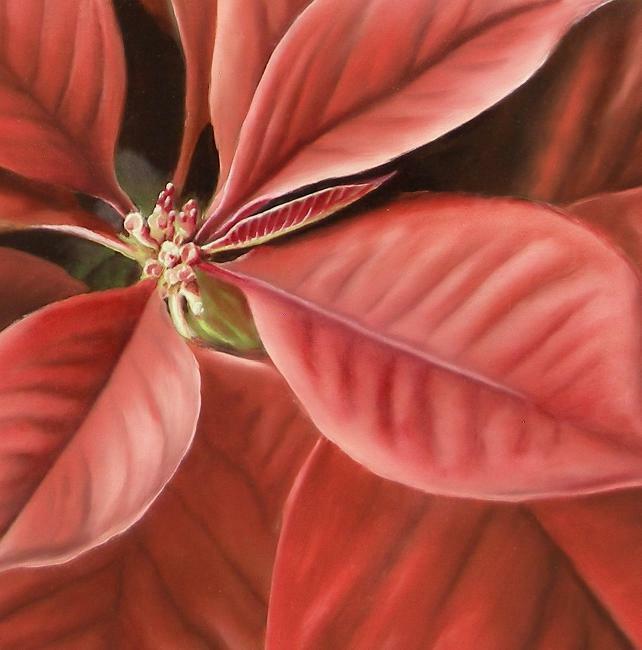 It was known as the Mexican fire plant then, and after his death, the plant was renamed poinsettia in his honor. The Legend behind the poinsettia. Most popular plants such as this also have a legend behind its creation. A young girl, Maria, and her little brother Pablo, always looked forward the local Christmas Festival. Each year at the village church, a large manger scene was erected along with parades and Christmas parties within the village. Because they were so poor however, they felt left out as they couldn't contribute to the festivities. They especially had wanted so much to give something for the Baby Jesus. When Christmas Eve Mass was to begin, on their way to the church, they found an odd green looking weed on the side of the road. These they picked and used as a gift to the Baby Jesus in the manger scene. They were teased and ridiculed mercilessly as they brought forward their gifts by the other children in the village. But Maria and Pablo pressed on, and laid their gifts down around the manger. As they turned to walk away, a silence fell on the teasing children as before their eyes, the weed leaves began to turn red. Soon, the entire manger was surrounded by these fire red flowers! From then on, the flowers were known as "Flores de Noche Buena" which means, flowers of the holy night. How to get your poinsettia red again. OK, now for another bit of information about these beautiful plants. What do you do with your poinsettia plant after the holidays? Well, the plants do turn back to green and will continue to grow. If you want it to turn back to red, here's what you do. Take a box that's larger than your plant, and in September cover the plant with the box for 13 hours a day. 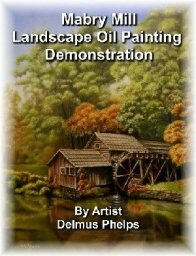 The lack of sunlight will fool the plant and it will begin to redden up. Take your plant out from under its box in the beginning of December to enjoy it. 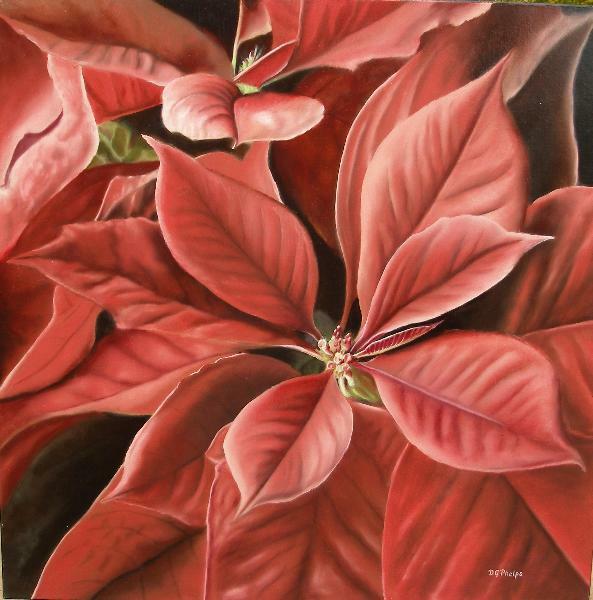 This Poinsettia painting was completed using my usual indirect Flemish painting method. The fiery red just can't be duplicated on the computer screen because most digital camera's can't handle them well. This is close, but the live painting is amazing to see in person.